Nous sommes à nos claviers pour produire la version française de cette page! Merci de votre compréhension. Value Circles is an opportunity to deepen research and share perspectives across territories. What do we personally value? How do we better connect to build a more inclusive “we”? 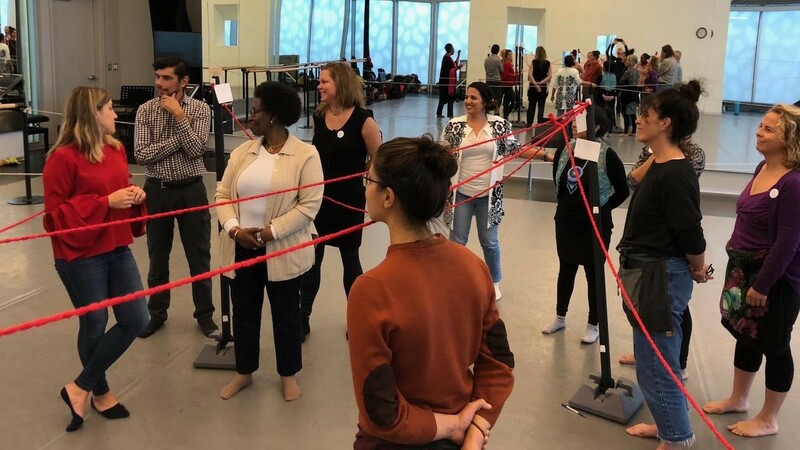 This interactive arts-based project creates connections across identity, culture and heritage; explores our understanding of individual values; and expands our circle, while having fun! Each of us living on Turtle island has a richness to offer. We acknowledge the complexity of living in a country haunted by settler colonialism; defined by settler values constantly colliding, shifting, changing with the ongoing influx of newcomers. We rejoice in the resurgence of indigenous peoples, cultures and ceremonies. We want to experiment with “techniques for living”- together and create lasting and strong relationships between and amongst the diversity of peoples that co-exist. Through the arts we can create systemic and social change. By offering a safe and non-judgemental space, we establish interconnections that will strengthen group dynamics, encourage cultural exchange, improve dialogue and provide perspectives from within. Our aim is to propagate a love for the arts and show how the arts can be an effective tool for making a difference for those who are participating and for those witnessing the results. For more information on having a workshop with your community, collaborating with us or about arts outcomes arising from this project, please do not hesitate to contact us. “Madhu’s Saris” started as a documentary focusing on Madhu Nambiar’s life as represented through her saris. The narrative concentrates on the complexities of her life, beginning in India and following her immigration to Canada. Featuring six of Madhu’s many saris, we learn about her marriage, her work life, her immigration to Canada, her family, and other cultural activities. At its core, “Madhu’s Saris” is a story of immigration and how Madhu adapted to her new life in Manitoba and what adaptation means to Madhu, in particular how she did not abandon her saris. In partnership with Metropolis Bleu, Farah Fancy of Herencias ran a 8 session workshop in Joliette, Quebec, to promote the expression of healthy rebellion in young people through the creation of a theatrical performance. The project also aimed at encouraging positive and stimulating communication between Quebec’s two major linguistic communities. The result was an eclectic cabaret by the students of Academy Antoine Manseau under the artistic direction of Farah Fancy and Phillip Pascal Parent. The project was intended for 14- to 17-year-olds currently attending high school. It reached students in the following programs: Performance arts, drama, intensive English, intensive French, international education, and other specialized programs. It was, in fact, intended for any group interested in participating in a project that is enriching from an educational point of view — active practice of official languages, creation and production of a work for the stage — and from a social perspective — channeling rebellion and the feelings of unease common in young people.